This touching story, based on the testimony of an elderly woman named Mary, demonstrates how one godly life can bring many to experience the true meaning of Christmas. 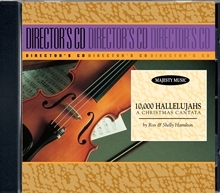 For those who enjoy Handel's Messiah, Ten Thousand Hallelujahswill be a special blessing with highlights of the Messiahinterwoven throughout the musical. From the joyously moving opening original piece by the Hamiltons to the triumphant finale of "The Hallelujah Chorus", this musical is truly memorable.